Kobelco K-Dive: the future of construction - Kobelco Construction Machinery Europe B.V.
As a forward-thinking construction manufacturer, Kobelco Construction Machinery is constantly looking for ways to help support the future of Kobelco excavators through the development of advanced technologies. These developments are always focussed on providing real solutions to either customer, environmental or even societal problems. For example, decreasing numbers of new operators in the construction and civil engineering sector, issues in transferring skills from experienced engineers to younger apprentices, and more strict health and safety regulations on jobsites, could fundamentally change the way construction work is done in the future. With this in mind, Kobelco believes that it is not only essential to improve the performance of its own excavators, but also to consider how the construction industry as a whole needs to adapt to external challenges. 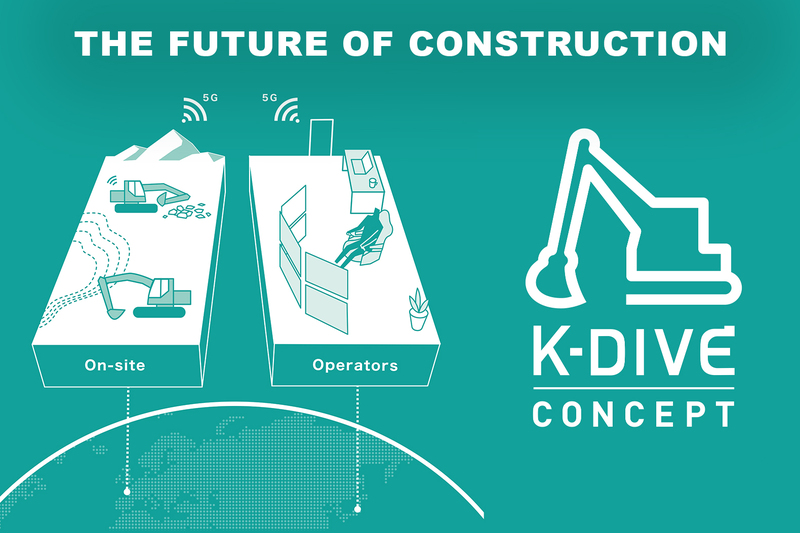 While still just a concept, the idea of K-Dive was borne from the principle that construction machinery could be operated remotely, reinforcing Kobelco’s strategy of ‘creating a jobsite for anyone’. In theory, this kind of remote working could give construction companies access to dangerous jobsites such as industrial waste disposal sites, disaster zones, and regions of extreme cold, from the comfort and safety of an office environment. Potentially, this could enable operators who are unable to physically work on a jobsite due to geographical or time restrictions to still be instrumental in activity. During the early stages of the K-Dive concept’s development, Kobelco identified that there should be no loss of productivity, unfamiliarity of the controls or other features when trying to operate an excavator remotely. In order to achieve this, the manufacturer has created a highly-realistic simulator ‘cabin’, which looks and feels like an excavator working on a jobsite. Visitors to BAUMA 2019 will be able to try this simulator, which even features a realistic vibrating seat, for themselves. During further technical development of the K-Dive concept, Kobelco hopes to make it possible to transfer data such as deployment records and running work totals for the machine in real time via the high-speed 5G mobile communication systems (once launched). Technologies to assist the remote operation of excavators are soon going to be tested in Japan – field monitoring is expected to be completed by 2020. In addition, Kobelco is currently developing a ‘site telework sharing’ concept for next-generation construction jobsites. This involves creating a network system for jobsites and construction machines using a remote cockpit, meaning that contractors can establish and recruit operators from other regions or even countries. This also means that contractors can select operators for jobsites based to their specific experience and skills. As a result, operators will, in theory, have access to any jobsite anywhere in the world without being restricted by location, and can even work during times that suit their lifestyle. This remote cockpit also enables contractors to view progress of a jobsite in real time, and it can be used as a virtual training room so apprentices can improve their operating skills remotely. Visit us on stand FN.1016 at BAUMA 2019 to find out more about the Kobelco K-Dive concept and test your own operating skills in the virtual reality simulator for yourself!